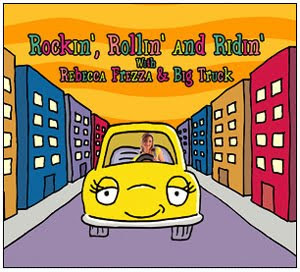 If a top kids party/dancing music list exists, Rebecca Frezza & Big Truck's latest CD, Rockin’, Rollin’ and Ridin’ should be up at the top of the charts. With funky rock guitar riffs and great dance tunes, kids (and adults) can't help but get on their feet, shaking and shimmying to the beat. This newest album even includes a song sung with Roscoe Orman (Gordon from Sesame Street). Now that's star power! I can't believe that I hadn't heard of Rebecca Frezz & Big Truck before receiving this review CD! Regularly featured on Noggin Channel and PBS KIDS, the seven-piece kids band has received numerous awards from the likes of Parents' Choice, Nappa Gold and iParenting and more. Their sound is similar to Laurie Berkner or Milkshake, but with a little heavier rock beat. Our only complaint is that the CD is too short, with only eight songs. We could easily listen to this music for a much longer period! True to its name, Rockin’, Rollin’ and Ridin’ features several transportation themed songs, "Big Truck", "Motorcycle Boy" and "Rocketship." But our favorites are the rockin' and rollin' songs, especially the catchy echo-song "Hey-O" (featuring Roscoe Orman). The kids love repeating after Rebecca and Roscoe and singing back the "Hey-O" phrase. Another favorite is "Robot Dancer", with the psychedelic, boinging noises perfect for energetic jumping exercises. The "Rock Like This" get up and dance lyrics tell you exactly how to rock like that. Liven up your children's music collection and add this up-tempo album to the repertoire. The songs are appropriate for all ages of children, not just the youngest crowd, and parents will appreciate the rock and roll sound as well. Highly recommended by both my toddler and preschooler (and me). Rebecca Frezza & Big Truck has kindly offered to give away a copy of their newest CD, Rockin’, Rollin’ and Ridin’. To enter, visit Rebecca Frezza & Big Truck's website http://bigtruckmusic.com/ and leave a comment with the name of one of their songs. • Contest ends on Monday, December 7th, 2009 at 11:59 PM CST. Butterfly! I don't think I've ever been first. . . I like the Robot Dancer lyrics! Carnival Ride sounds like a fun song!! I would love to win this for my nephew! He is really into rhymes and music. I follow you on Twitter. Here is my tweet. My son would adore the Robot Dancer song -- he's so into robots at this point! Spooky Dance is the title of one of their songs! I think B3 (Bee Boppin' Boogie) has to be a great song, because it's so fun just saying the name! One of their song titles is "Rocketship."